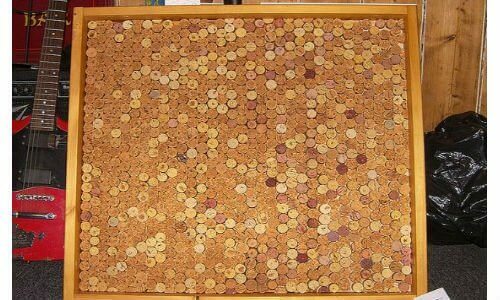 options out there, but I found that making a wine cork board is the most useful way to use up those wine corks. Take your picture frame and play around with the corks to see what type of pattern you want to make. You could a mix of some horizontal and vertical, or all of them in the same directions. Once you have your plan ready, you start hot gluing your corks in one corner of the picture frame. Just put a line of hot glue on one side of the cork, so that you don’t a have a visible hot glue mess on your cork board. Work your way across the whole center of the picture frame until you’ve completely cover the whole center of the picture portion of the frame. Once you’ve completed your frame, you can use 3M adhesive utility hooks to securely hang up your new wine cork bulletin board. These hooks will support up to five pounds of weight. Pin your favorite photos, important reminders and business cards to your new cork bulletin board and enjoy!